Improved ride and handling make the fifth-generation Mitsubishi L200 better than its predecessors, but what tow car talent does this big pick-up have? Here we're assessing what tow car ability the new Mitsubishi L200 has. It certainly looks like it has the beef to make a good tow car, but what's the reality? The fifth-generation L200 pick-up is a different beast from its predecessor. It promises more refinement, lower emissions and better fuel economy. It’s still big and heavy, though, with a kerbweight approaching two tonnes and a healthy 3100kg legal towing limit. What are we looking for? Well, a double-cab pick-up needs to be tough and practical, but it must also have enough cabin space to be a usable family car. In addition, we’re hoping the L200 Series 5 is a stable tow car. The Mitsubishi L200’s kerbweight of 1935kg (including 75kg for the driver) gives it an 85% match figure of 1645kg. We matched it to a Swift Elegance 570 with a Mass in Running Order of 1544kg – and the beefy 2.4-litre diesel had no trouble pulling it. Little goes on at very low revs, but from around 2000rpm the diesel wakes up, building to a peak 317lb ft torque at 2500rpm. Work the six-speed manual gearbox to keep the engine in the middle of the rev range and the L200 gathers speed with determination, taking 14.8 seconds to tow from 30-60mph. Once up to the legal limit, the L200 feels secure on smooth surfaces. However, on bumpy roads the Mitsubishi tends to bounce and can feel unsettled. In the lane-change test, the L200 generated surprising grip in poor conditions, although we could feel the caravan pushing. Braking is another area in which pick-ups lag behind passenger cars. 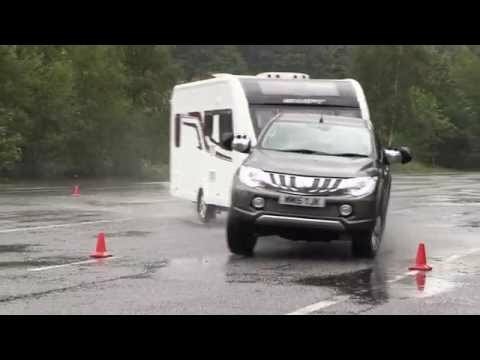 The L200’s 12.7m stopping distance isn’t great, but it’s acceptable for a test on a wet track. In regular towing we never had reason to doubt the Mitsubishi’s braking. The L200’s handbrake held truck and caravan securely on a 1-in-10 slope with no need to yank the lever on with undue force. The pick-up pulled to the top of the hill without fuss in two-wheel-drive mode. Four-wheel drive can be engaged at the twist of a knob. Although it can be unsettled by bumps at speed, the L200 otherwise tows well. Pick-ups can feel crude to drive, with bouncy rides, ponderous steering and unrefined engines. The new L200 addresses these. Let’s start with the ride. Although the L200 still uses leaf springs at the rear for their ability to cope with heavy payloads, the springs have been lengthened by 120mm. This has helped the new L200 ride more smoothly than the old model, although compared with most conventional passenger cars it’s still a bit bouncy at the back. Stiffer springs in front keep body roll in check. What’s more, the steering now has fewer turns from lock to lock (3.8 rather than 4.3), which makes the L200 feel more wieldy than before. The turning circle’s 5.9m radius is smaller than those of the Mitsubishi’s key rivals, and helps make the L200 less intimidating to drive than you’d expect of a vehicle that’s well over 5m long. The engine clatters away, but the noise is not intrusive for a pick-up, and the gearshift is smoother than before. The driver and front-seat passenger have plenty of room. There’s now rake and reach adjustment for the steering, so it’s easier to find a comfortable position. Forward visibility is good but the optional hard-top (£1210.82 excluding VAT) hampers rear visibility. There’s enough head and legroom for adults in the back to be comfortable, but don’t expect as much room as in a big 4x4. You can blame the priority of a pick-up: a practical loadbed. The Mitsubishi’s is 1470mm long, 1470mm wide and 475mm deep. That’s slightly shorter and narrower than an Isuzu D-Max’s bed, but a fraction deeper. Manual models have a 1045kg payload, rising by 5kg for autos. The Mitsubishi L200 has been priced very competitively; even the top-spec Barbarian costs just £23,799 without VAT. (Most pick-ups are bought as commercial vehicles and the VAT is reclaimed; private buyers would need to pay VAT.) Standard equipment includes a trailer stability system, seven airbags, sat-nav, a rear-view camera, leather upholstery, heated front seats and a full-size spare wheel. Fuel economy is class-leading, with an official combined figure of 42.8mpg. We achieved 24.4mpg while towing. Our focus is first and foremost on the Mitsubishi L200’s towing ability. It’s much improved, but it is still less settled than most passenger cars when towing over a bumpy road. For a pick-up, though, it’s very good, and asks owners to make fewer compromises than any other double-cab we know.